Ten years ago Laurie Benoit purchased seven acres of land in Buckland, only a mile from the dairy farm where she grew up. “We used to hay this field,” she remembered. They used horses to pull the hay wagons. 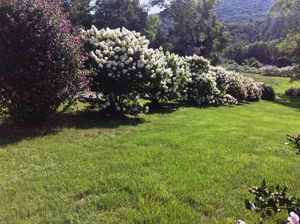 At the top of a steep driveway, the field is backed by a woodlot. Laurie’s son, Bob Benoit, built the house for his mother and her husband Barry Del Castilho. 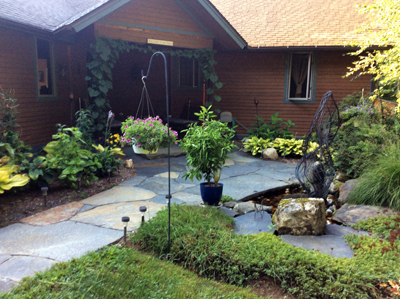 Laurie has created a charming landscape around her house, a true country garden with lots of native plants. Laurie went to plant swaps, including one in South Deerfield. Participants are supposed to bring plants to swap but at first she didn’t have anything to bring. 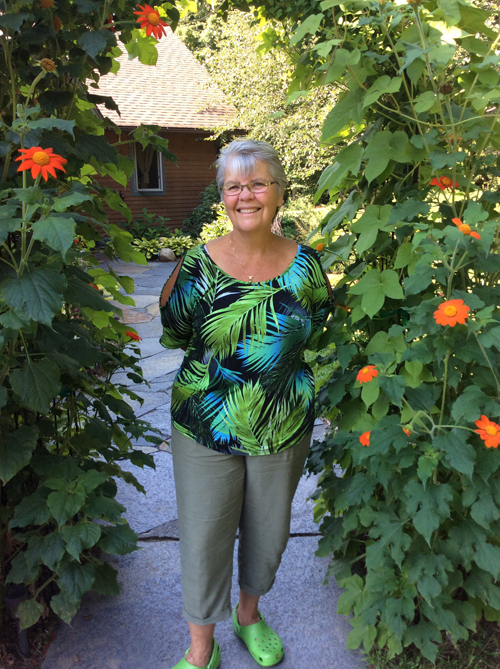 “I was one of the ‘low lives’ so I got to choose at the end of the swap.” Several red mulberry trees came from the Soil Conservation District sale at which she worked as a master gardener intern in 2015. She also planted two redbuds, two flowering dogwoods, a river birch, a weeping flowering cherry and crabapples. Butterfly bushes, various succulents and one of her favorite shrubs are planted near the deck. Beautyberry (Callicarpa japonica) isn’t native but she grows it because she loves it. Its myriad tiny flowers in late summer are followed by neon purple berries that really stand out in the landscape and are eaten by the birds. “It’s one of the ones I paid money for-- $25 at the Northampton Farmers Market,” she said. The entrance to her garden and house is marked by an arbor over which is draped a sweet autumn clematis. 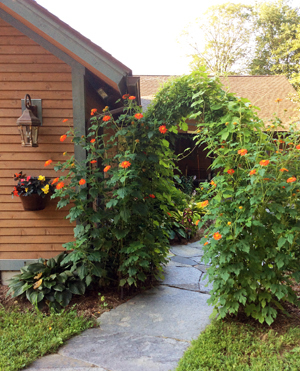 Huge orange Mexican sunflowers (Tithonia rotundifolia) add color to the arrangement. A flagstone walk leads to the front door and expands into a terrace with a small pool adorned with a fountain with a copper wire sculpture created by a local artist. In the spring there are scillas and grape hyacinths and what she likes to call ‘narcissists.” She doesn’t grow tulips because of the “traffic” from deer as well as bears, bobcats, woodchucks and foxes from the woods. Peonies follow the bulbs and then summer-blooming hibiscus, a lovely white with a purple center, and Physostegia virginiana or so-called obedient plant. There is a healthy stand of this plant with long-lasting lavender spikes but she said she regrets planting it because it takes over. At the front door are pots of tuberous begonias and beds of hostas and astilbes. A row of day lilies and bearded iris line the path to the south-facing morning deck. On both sides of the house are retaining walls made of stone dug up from the property during the house construction. When she saw an article by Pat Leuchtman in The Recorder in 2014 announcing the 2015 training program, Laurie immediately applied. 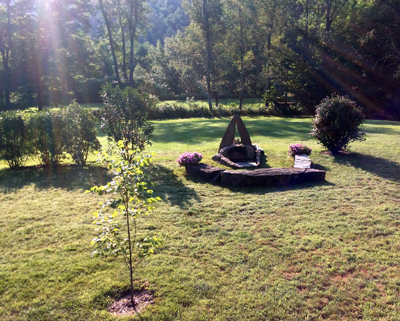 Just down the slope from the deck is a stunning fire pit created in memory of her son, Bob, who died unexpected in 2013 at the age of 44. Two arched stones frame a view of the rising moon at certain times. The upright plinths go as deep into the ground as they are above it. Three huge rectangular stone slabs provide benches for enjoying the fire at the base of the arches. 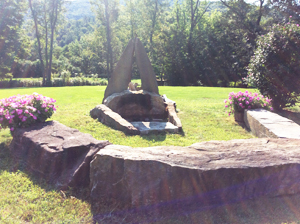 Laurie said the slabs were originally the foundation of an abandoned barn in Sandisfield. Matt Shippee, owner of Shippee Stonework in Hatfield who was a close friend of Bob Benoit, did the stonework. “My son was someone who loved stone. It’s quiet here when you lie on the stones. 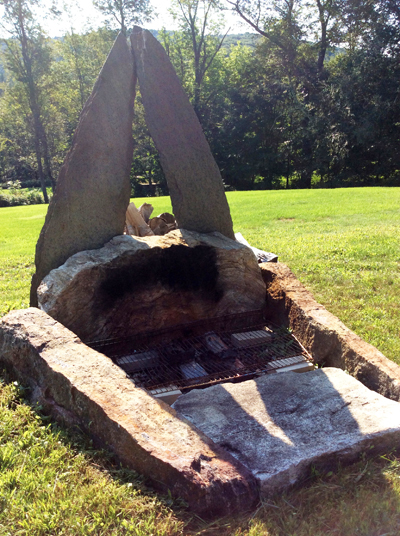 It’s gorgeous—the bugs not withstanding,” she said.